Is it ethical to use firefighters as props while a forest burns in the background? 460 hectares of forest were burning uncontained and a hill was smouldering in the background. 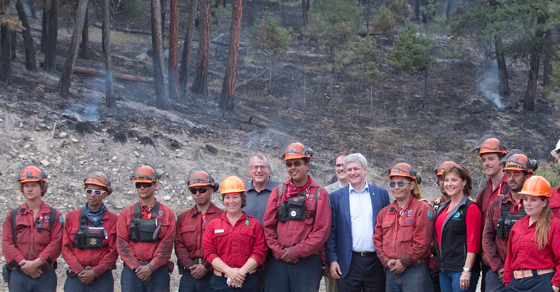 Is it ethical to use firefighters as props in a political photo op, particularly at the same time as 460 hectares of forest are burning uncontained and a hill smoulders in the background? That’s one question being asked following a joint photo op Thursday by Prime Minister Stephen Harper and B.C. Premier Christy Clark at the Incident Command Post in West Kelowna, B.C. 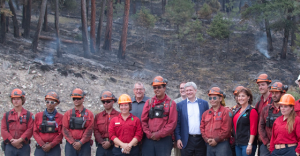 Seventy West Kelowna homes had been evacuated at the time (residents have since been allowed to return home) and, as the Canadian Press described, there was “smoke billowing from a hillside behind” Harper, dressed in a blue sports coat, as he addressed the media. “For a second straight day, firefighting efforts at the Westside Road fire were the backdrop for political photo ops. 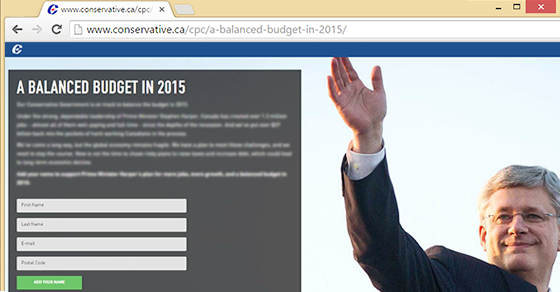 Where did the Conservative Party of Canada's webpage celebrating a "balanced budget in 2015" go? Editor’s note: A few hours after PressProgress published this story Wednesday evening, two previously dead links on the Conservative Party’s website cited by this story were reactivated and now point to content different from what originally appeared at those URLs. This post has been edited to reflect new developments in this story. Where did the Conservative Party of Canada’s webpage celebrating “a balanced budget in 2015” go?